Movie fans have always shown a special attachment towards cop stories. A movie in which the lead actor plays the police has always been a landmark movie for the actor. 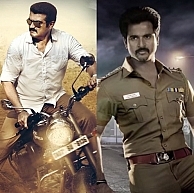 Some classy cops from Tamil cinema are Alex Pandian (Superstar Rajinikanth), Raghavan (Kamal Haasan), Sakthivel (Thala Ajith), Sathiyamoorthy (Ilayathalapathay Vijay). Anbuselvan (Suriya) and Aarusaamy (Vikram). Hopefully two more will be added to the list in the coming days: Sivakarthikeyan of Kakki Sattai and Thala Ajith, again, from Yennnai Arindhaal. A silver 'kaapu' is seen on their right hands. Both the first look / motion posters feature their lead actors in a whitey full sleeved shirt rolled into half. They also sport similar 'horseshoe' mustaches. Vaalu gets postponed but there is good news! Rendavathu padam is for everybody! Simbu to romance yesteryear actresses! What did Karthik Subbaraj think about Kaaviya Thalaivan? People looking for online information on Ennai Arindhaal, Kakki Sattai, Sivakarthikeyan, Thala Ajith, Yennai Arindhaal will find this news story useful.